If you have been shopping for a late model used Honda Civic, you have probably been wondering why the prices seem a bit higher than you might expect. 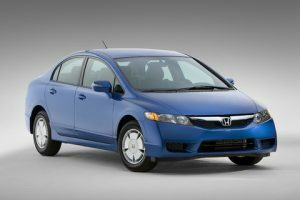 Several factors, dating back to 2008, have compiled to keep the resale value of several Honda offerings, especially the Civic, at record levels. Some are still able to command close to their original MSRP. The first factor was the economic downturn that began in 2008. Potential buyers found themselves needing to hold on to their cars longer due to job loss or being afraid of a layoff. That slowly led to an absence of quality used cars on dealer’s lots. The trend of holding onto cars continued through late 2010. In March of 2011 the twin disasters of an earthquake and tsunami devastated the automotive industry in Japan. With several of the major players, including Honda, unable to produce sufficient numbers of new fuel efficient cars, buyers either turned to other automakers or bought used cars. This further strained the dwindling supply of used cars, driving a sharp uptick in the resale value of fuel efficient cars like the Honda Civic. By the second quarter of 2011, many people were tired of waiting to buy a new car and sales increased. Unfortunately, many of these people were trading in cars that were over five years old or not fuel efficient. This left plenty of undesirable cars on the used market, but fuel efficient cars were still in shorter supply than many people would like, driving resale values even higher. As a result of all of these factors, the resale value of a used Honda Civic can be nearly as high as its original selling price. Resale values are currently 30% higher than they were in 2008. This situation will reverse itself as the supply of fuel efficient new cars returns to normal. Honda predicts that it will be back at pre-disaster supply levels by March, 2012. When that happens, the average price of a three to five year old used Honda Civic should drop quickly. I bought used Civic coupe and I did nor reagret! I wonder what I could get for my 2010 Civic Si.